Use your cellphone as your boarding pass? | BlackBerry Blast! BlackBerry Blast! > News > Use your cellphone as your boarding pass? Use your cellphone as your boarding pass? If you fly Continental airlines in the next three months, and have a connection in Houston, you'll likely be able to take part in a pilot program that allows passengers to board flights using just a cellphone or PDA instead of a paper boarding pass. The three-month pilot program launched Tuesday at Houston's Intercontinental Airport. If the test is successful, the program could expand nationwide. Instead of using paper boarding passes, the airlines will send a special bar code to the cell phone or PDA of each passenger. The bar code will store the passenger's name and flight information. 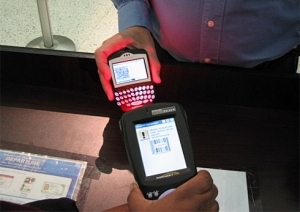 A TSA working will scan the bar code with a special handheld device. Passengers will still need to show a photo ID to board the plane. "We have been in favor of this for a long time and had fairly consistent dialogue with TSA on our desire to do this," Mark Bergsrud, a Continental executive, told the Houston Chronicle. "We were ready technically and we are pretty nimble with our ability to develop software and test it."